"I love you, Matt. Oh wait, Mark." Sound familiar? You're not the only one to accidentally mix up your kids' names, even if you gave each of them unique names: New research in the online journal PLOS One shows that the slip-up is more likely if your kids have the same initials. Researchers at the University of Texas at Austin polled 334 people and found that they were more likely to be mistakenly called a sibling's name if the two of them shared an initial (Deb/Diana) or a final sound (Ben/Ayden), compared to names with no commonalities. Here, five more surprising baby-naming mistakes new parents should avoid. Boys with borderline boy-girl names such as Shannon, Aaron, and Jamie tend to have more behavior problems in middle school than those with boy-only names, according to one Education Finance and Policy study. Let's call it rebellion. Creativity can hinder futures: According to findings from the National Bureau of Economic Research, teachers subconsciously expect less from students whose names have unusual spellings, and as a result, give them less attention. Hit fast-forward, and people think less of co-workers whose names they can't easily pronounce, according to a study published in the Journal of Experimental Social Psychology. 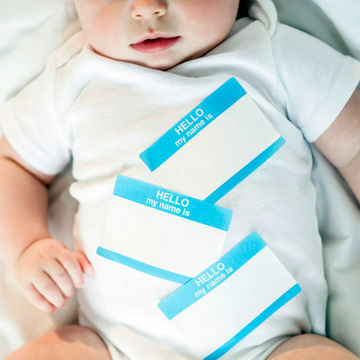 Unless your kid's in deep doo-doo, the middle name is usually irrelevant—and choosing it first can lock you in to first names you aren't crazy about, says Laura Wattenberg, author of The Baby Name Wizard, Revised 3rd Edition: A Magical Method for Finding the Perfect Name for Your Baby. Choose a prename you love first, and let the middle name come second. Children with head-scratching names are more likely to grow into narcissists than those who have less individualistic names, according to Jean M. Twenge, Ph.D., a psychology researcher at San Diego State University and author of The Narcissism Epidemic: Living in the Age of Entitlement. While every child is unique, parents who choose out-there names may add more emphasis on how special their kids are, she says. The best way to see how a name is going to go over is to run it by others, Wattenberg says. And that doesn't mean asking the anonymous Internet for opinions. Poll a small focus group and swear them to secrecy. Related: Baby Names: To Tell or Not To Tell?